This fluffy, tender gluten free red velvet cake gets its burgundy hue from pureed beets in the cake. 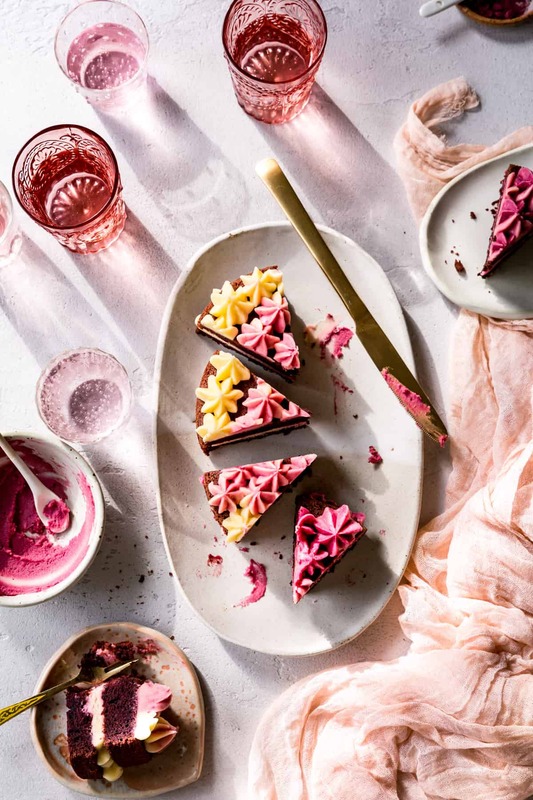 Beet powder tints the ombré cream cheese frosting pretty shades of pink. I never got the point of red velvet cake until a few years ago when my niece requested one for her birthday. Determined to skip the bottle of red food coloring, I researched natural ways to tint the classically colorful cake. 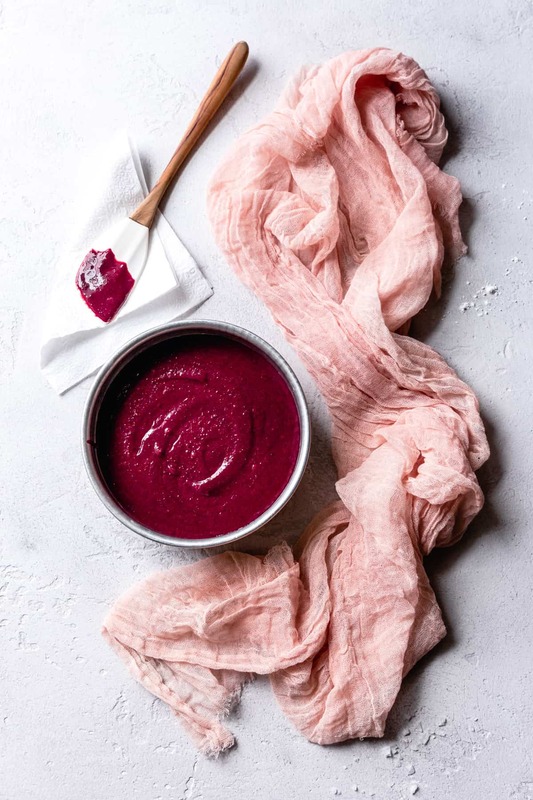 I found a blog called SophistiMom (which sadly doesn’t seem to exist anymore) that detailed blending pureed cooked beets into the batter. Keeping the batter as acidic as possible preserved its rich burgundy hue. I whipped up a batch, brought it to the party, and took a taste. 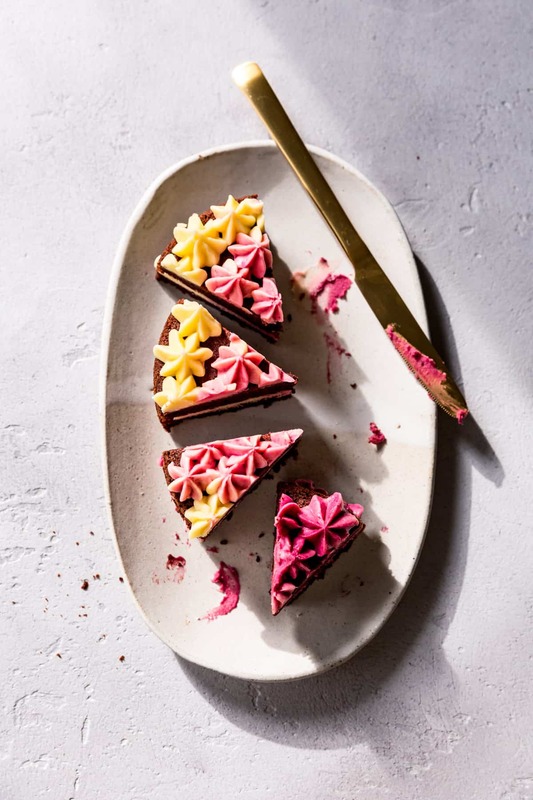 Earthy cocoa-beet cake melded with bright cream cheese frosting and I was hooked. Red velvet cake is thought to have originated during the Victorian era. The term “velvet cake” referred to any cake with a soft, tender crumb. 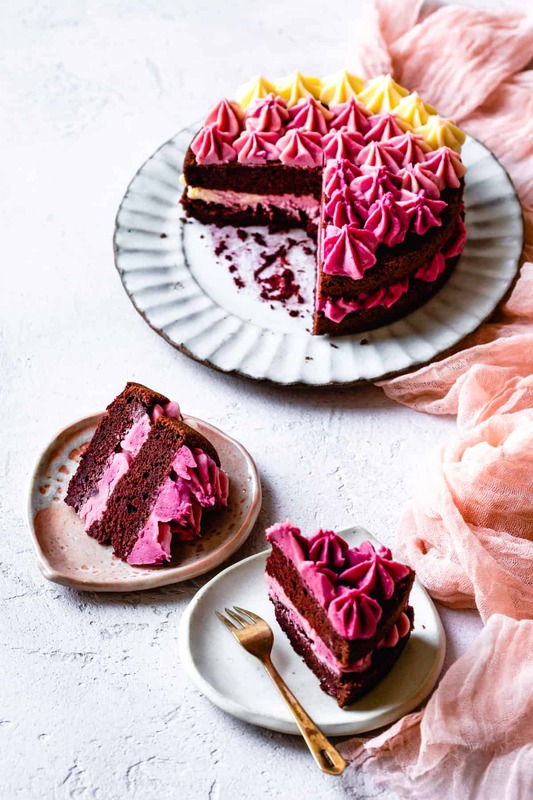 The red velvet cake got its color from natural cocoa powder which, when combined with acidic ingredients like vinegar and buttermilk, turned the cake’s crumb reddish-brown. 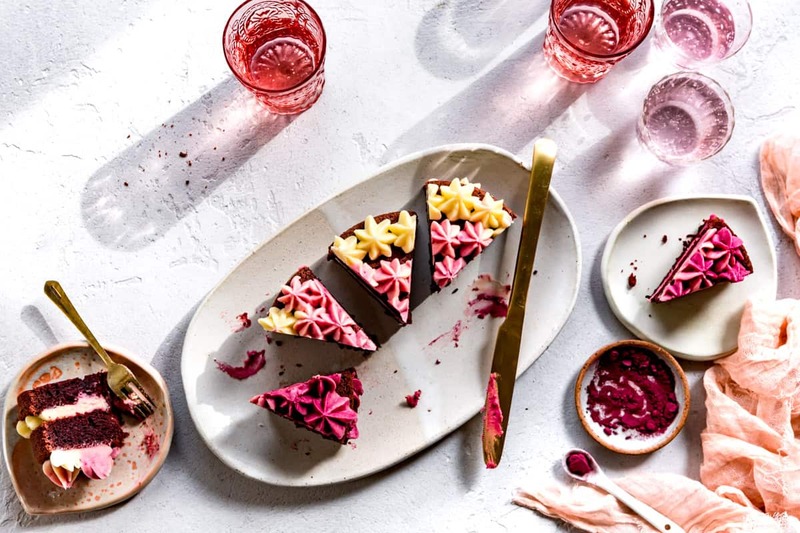 During World War II rations, beets were often used as fillers in cake batters, and cakes were further tinted with the water from boiled beets. Today red velvet cakes commonly get their crimson hue from a large amount of red food coloring. But there are natural ways to color your cake too! 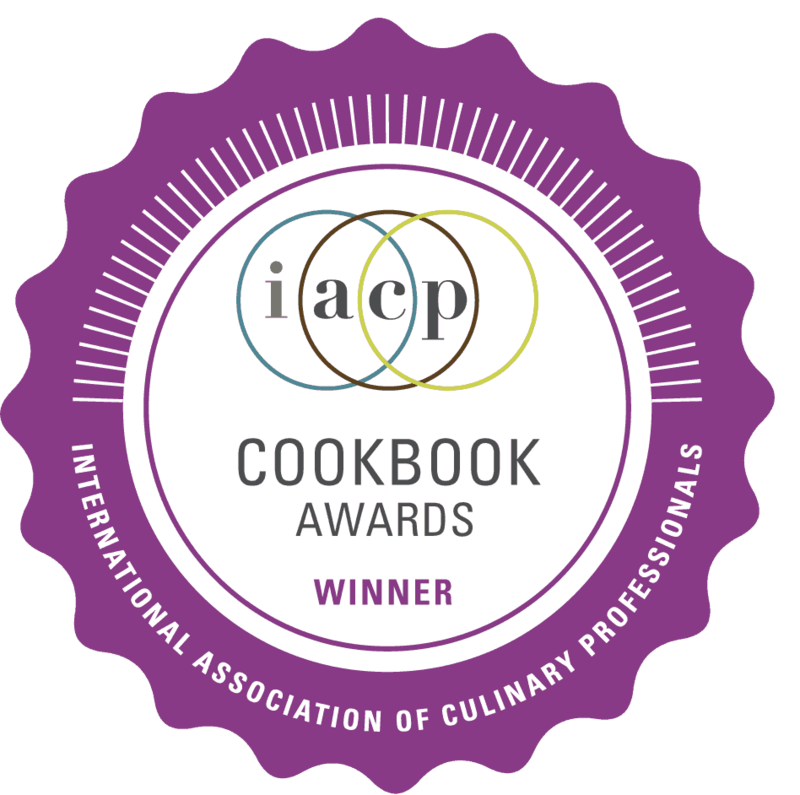 This method uses pureed cooked beets. Unable to find the original recipe that I tried years ago (my gateway red velvet cake! ), I did find another blogger’s variation on the same recipe. I cut the recipe in half to make a petite cake, and began testing a gluten free version. The key to keeping the color of natural red velvet cake bright is acidic batter. Buttermilk, lemon juice, and a splash of vinegar all add acidity. For the leavening, acidic baking powder is preferable to basic baking soda, though a small amount of baking soda adds big lift. The cocoa powder turned out to be the real wild card in this recipe. All cocoa powder is an end product in the chocolate making process. First cocoa beans are ground into a liquid form called chocolate liquor (contrary to its name, it isn’t alcoholic!) The cocoa butter, which makes up about 50% of the bean, is pressed out and cocoa solids are left behind in a crazy-looking cake. This cocoa solid cake is ground into cocoa powder. Natural cocoa powder is the result. The pH of natural cocoa powder ranges from 5.3 – 5.8, which is slightly acidic (7 being neutral on the pH scale of 0-14). The most commonly found brand of natural cocoa powder in the US is Hershey’s; I usually choose Tcho, which is organic and made in San Francisco. When natural cocoa powder is treated with alkali, the result is Dutch-process cocoa. Dutch-process cocoa has a pH ranging from 6.8 – 8.1 (neutral to slightly alkaline). The alkalization process mellows the flavor of the the cocoa powder (think Oreos!) and the powder is darker in color and more soluble. Droste is a commonly found brand in the US, but my favorites are Rodelle’s organic cocoa and Guittard’s Cocoa Rouge. Black cocoa is extra alkalized and especially dark in color. Brands don’t always label their cocoas clearly, so when purchasing cocoa, check the ingredient list. Natural cocoa will have just one ingredient – cocoa powder – while Dutch-process cocoa will contain alkali as the second ingredient. Normally for this recipe, natural cocoa would be preferable to maintain the most acidity in the batter. However, when I made the cake with just natural cocoa, the (admittedly bright red) cake turned out dense, with a more pronounced beet flavor and barely a hint of chocolate. I tested versions with half natural and half Dutch-process cocoa; the color was a lovely orange-red but I still didn’t love the flavor. The version made with all Dutch-process cocoa had a burgundy crumb and a soft, rich, mellow cocoa flavor that was the clear winner. So even though my “red velvet” cake is more burgundy brown, flavor always wins! 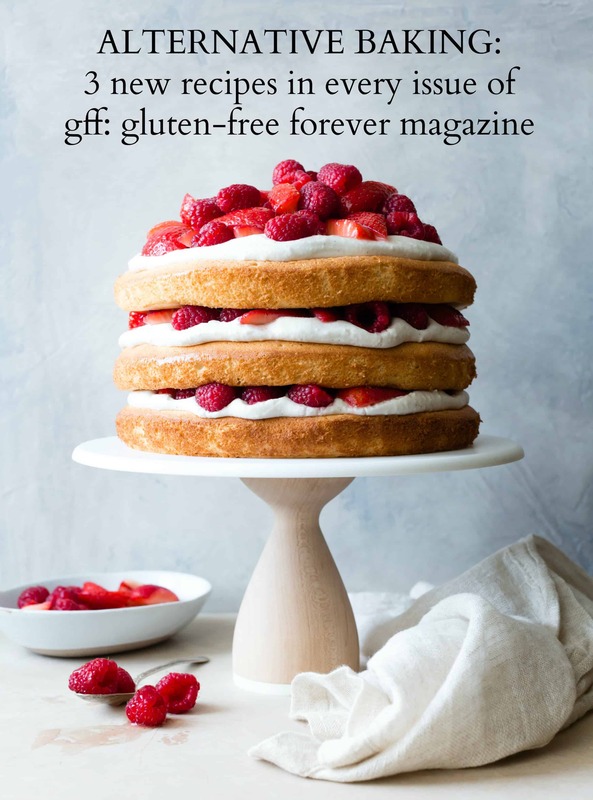 When it came to choosing flours for my gluten free red velvet cake, I went for a blend of oat flour for fluff, sweet rice flour for stickiness, and ivory teff flour for softness. 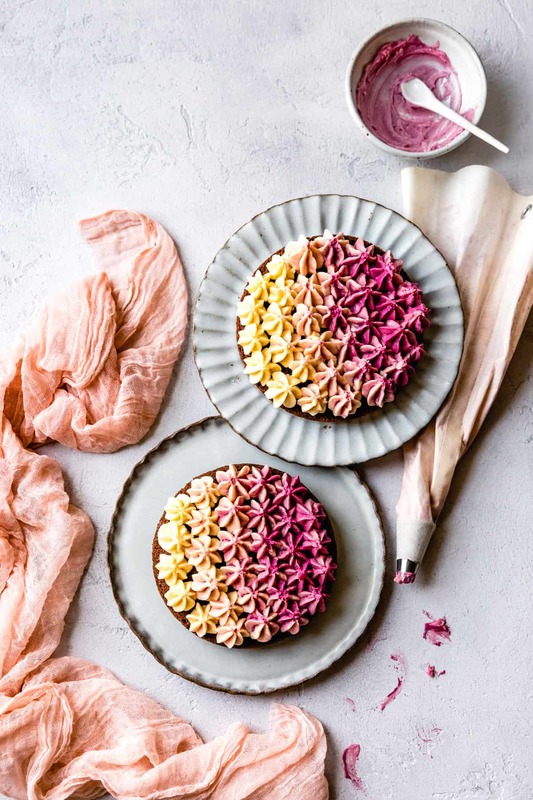 In addition to adding fiber and nutrients, the oat and teff flours round out the flavors of the cake, complimenting the earthy taste of cocoa, vanilla, and beets. With all those good tastes sharpened by tangy buttermilk, lemon, and vinegar, I can pretty much guarantee that this will be the most flavorful red velvet cake you’ve ever tasted. If you need flour substitutions, have no fear. Ivory teff flour can be a challenge to source (though you can order it here). Brown teff will likely work in its place, or try millet flour. You could also try replacing all three flours with the gluten-free all purpose flour blend of your choice (use the weight measurement for the most accurate results). I love cream cheese frosting so much, I don’t know why other frostings bother existing. Prior to tasting a really good red velvet cake, I theorized that the only reason people liked the things were because they’re usually piled high with cream cheese frosting. But for this über-flavorful version, the frosting is simply the icing on the cake. My friend and assistant Bebe had the clever idea to tint the frosting pink with beet powder and pipe it in an ombré pattern. This is actually far easier to do than it may appear as long as you’ve got a piping bag and a large star tip on hand. 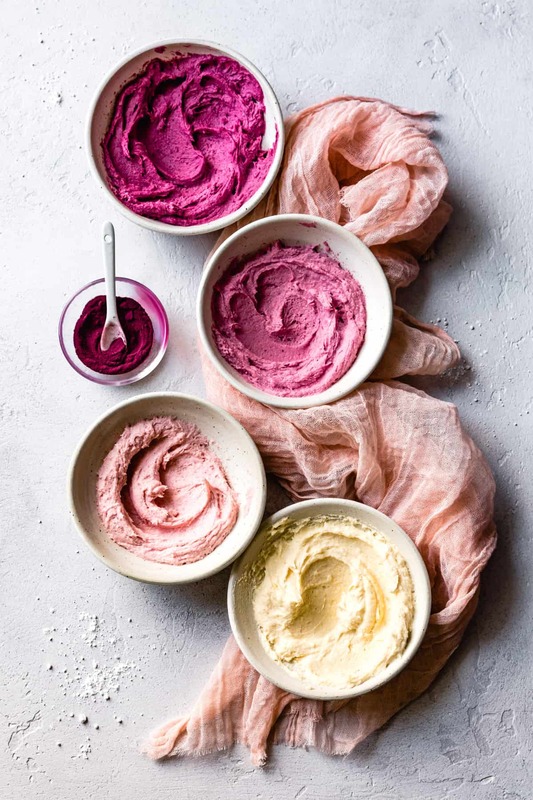 Just divide the frosting into 4 bowls and add different amounts of beet powder to each bowl for different shades of pink. Layer the frosting in the bag, starting with the plain white frosting and ending with the darkest hue, then pipe dots over each cake half, following the curves of the cake. Can you taste the beets in this cake? Not really. 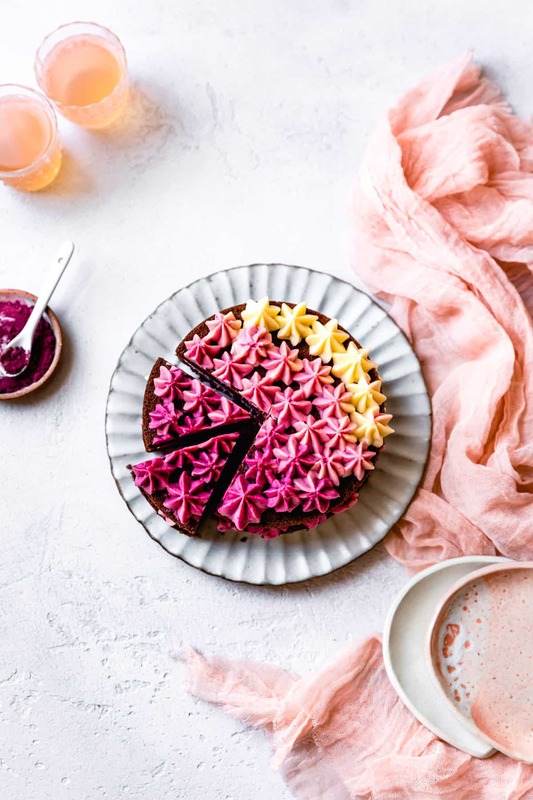 The frosting tastes just like plain cream cheese frosting – even the one with a whole teaspoon of beet powder stirred in! 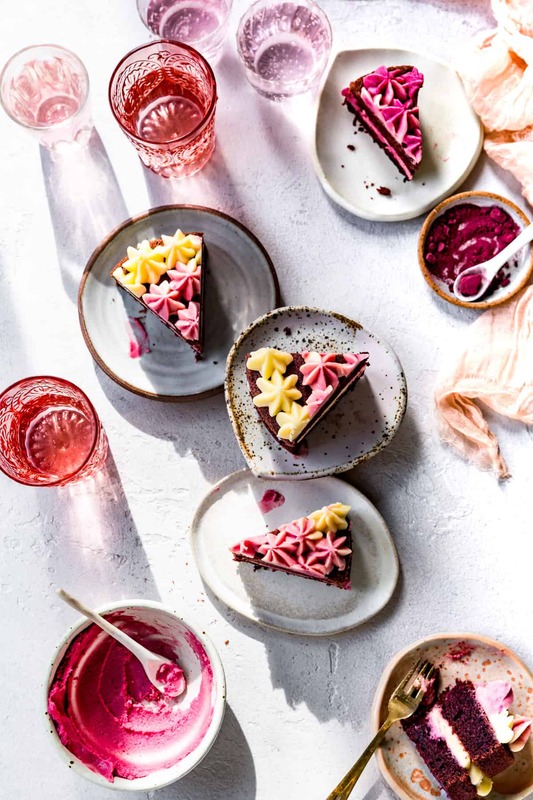 In the cake, the beet flavor blends with the cocoa, vanilla, and flavorful flours to create an earthy-tasting base. If you’re looking for it, you get the beet flavor in the finish, but most people wouldn’t be able to guess the secret ingredient if you didn’t give them a hint. 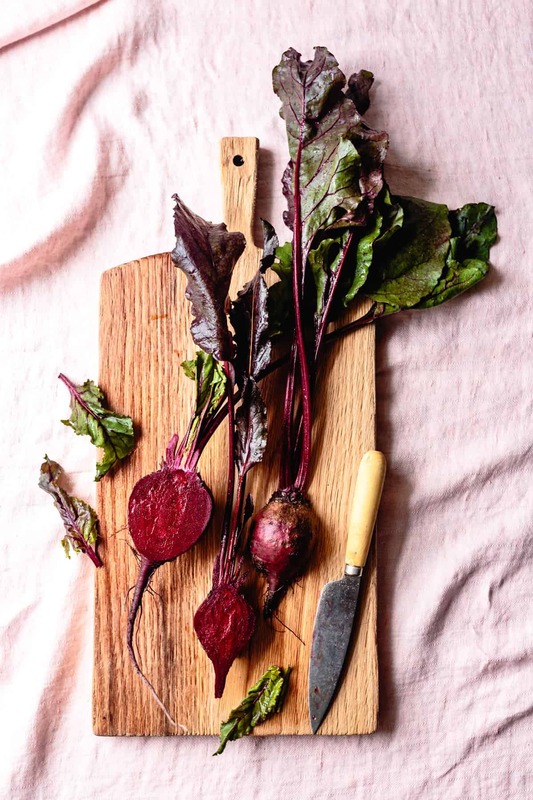 The beet does add natural sweetness and moisture, meaning that less sugar and oil are needed to produce a tender crumb. This recipe makes a petite 6-inch cake with 2 layers, perfect for about 8 servings of cake, with a high frosting to cake ratio because, as we’ve discussed, CREAM CHEESE FROSTING. 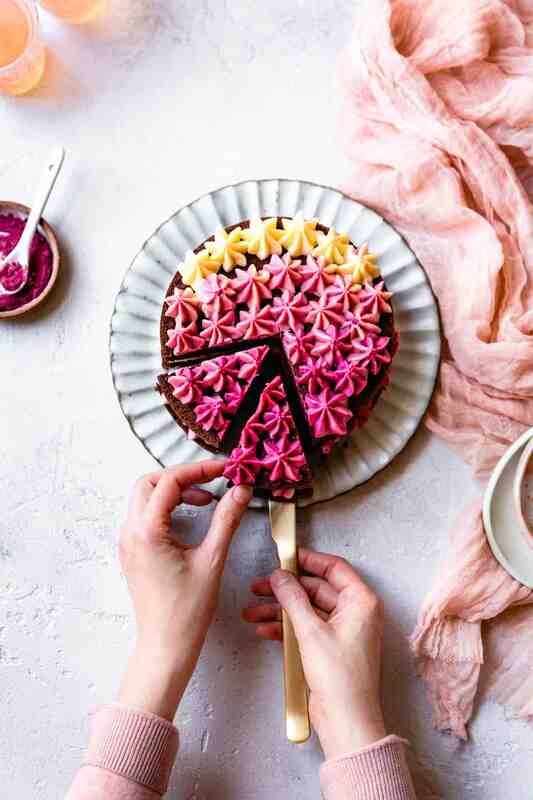 But you could easily double the recipe and bake this cake in a 9-inch square pan for a small red velvet sheet cake. A single batch of frosting should be plenty for a single layer cake. To feed a crowd, triple the cake recipe and double the frosting, and prepare in a 9×12-inch pan. For red velvet cupcakes, fill 6-8 muffin cups two-thirds of the way with batter and decrease the baking time as needed. I tested this recipe 10 times to get it just right! Every batch got devoured with no crumbs left behind. 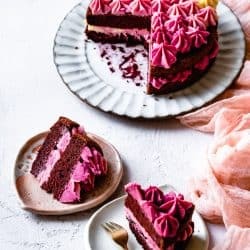 But this final version boasts all the things I want in a gluten free red velvet cake: burgundy hue, fluffy and tender crumb, and mellow chocolate flavor. I streamlined the recipe as much as possible, using oil instead of butter so that the cake can be made with just one bowl and a whisk. While some recipes call for grating raw beets, I find this an unpleasant and messy task. I prefer to boil the beets, let them cool, and puree them in a food processor. I’ve given all measurements in weight as well, so you can simply weigh the ingredients right into the mixing bowl. Do you love or hate red velvet cake? Let me know in the comments! And please let me know if you give this gluten free red velvet cake a go. It would make a super sweet gift for a Valentine or Galentine, washed down with a nice sparkling rosé. I know I’d feel quite loved if someone made one for me. 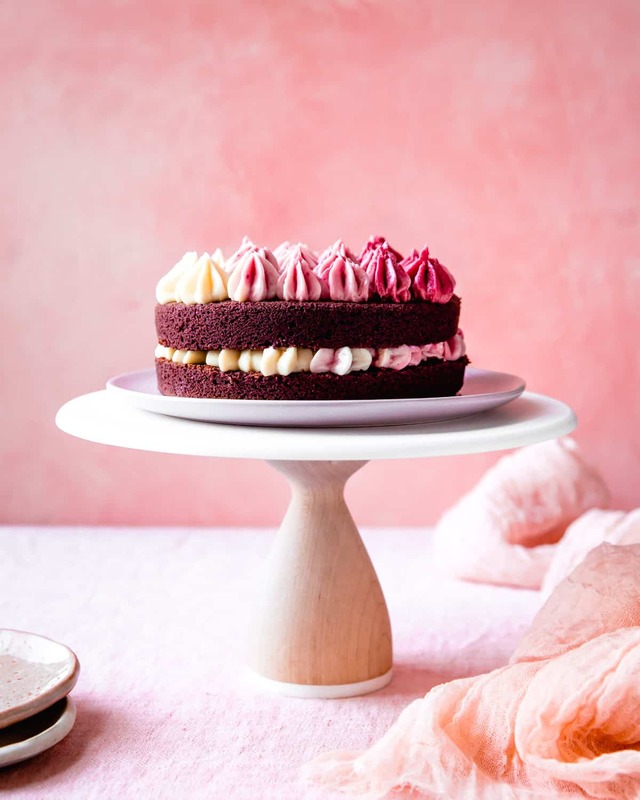 This all natural gluten free red velvet cake gets its burgundy hue from pureed beets + beet cream cheese frosting piped in a pretty pink ombré. Look for beet powder at health food stores with the herbs and spices, or order it here. (Extra beet powder is delicious with steamed milk and honey for a sweet beet latte!) I’ve given the measurements in grams which means that if you have a scale, you can weigh everything right into the bowl, zeroing out the scale between ingredients. See notes below for more recipe details. Position a rack in the center of the oven and preheat to 350ºF. Grease a 6-inch round cake pan with softened butter and line the bottom with a round of parchment paper cut to fit. 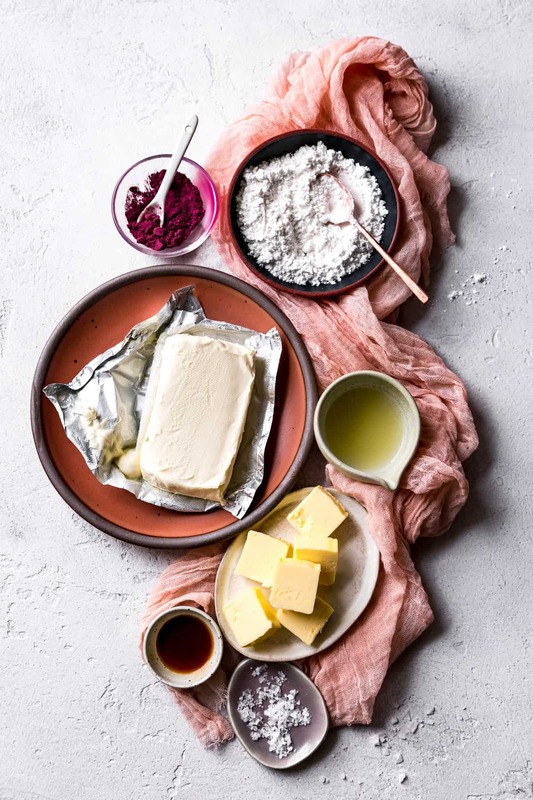 In a large bowl, whisk together the sugar, oil, egg, beet puree, buttermilk, lemon juice, vinegar, and vanilla. Place a strainer over the bowl and add the teff, sweet rice, and oat flours with the cocoa powder, baking powder, baking soda, and salt. Sift the flours into the beet mixture and whisk or stir to combine. 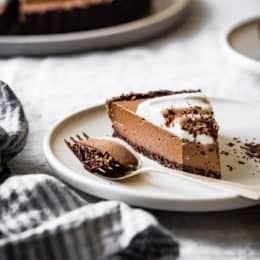 Scrape the batter into the prepared pan and bake until the cake springs back to the touch and a toothpick inserted near the center comes out with moist crumbs, 35-45 minutes. Remove from the oven and let cool slightly, then invert onto a wire rack, peel away the parchment, and let cool completely. The cake can be stored covered at room temperature for 1 or 2 days. Make the cream cheese frosting as directed. Divide into 4 bowls. Leave one bowl white. To the second bowl, add a big pinch of beet powder. To the third bowl add ¼ teaspoon beet powder. And to the fourth bowl add 1 teaspoon beet powder. Stir each bowl well, adding more color if you like (the color continues to intensify as the frosting sits). Cut the cake into two even layers using a serrated knife. Place the bottom half on a serving plate, cut-side up. Place the top half on a rimless plate or cutting board cut-side down. Layer the frosting into a large piping bag fitted with a large star tip, starting with the white frosting and ending with the most vibrant frosting. Pipe a line of frosting on the bottom cake layer, following the curve of the cake. Repeat with the top cake layer. Return to the bottom cake, and pipe another row of frosting next to the first. Repeat with the upper layer. Continue until both layers are covered in frosting; you should have just enough frosting to cover both layers, though if your frosting is extra fluffy, you’ll have a bit left over. Carefully place the top cake layer over the bottom cake layer. The cake is best served at room temperature, though it’s easier to cut when cold. 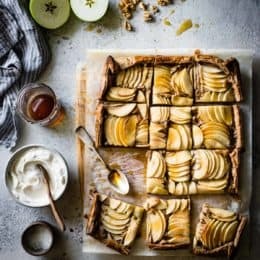 Optionally chill the cake until firm, then cut it into wedges using a large chef’s knife dipped in hot water and wiped clean between cuts, then let the slices come to room temperature before serving. Store leftover cake refrigerated airtight for up to 3 days; serve at room temperature. To make the beet puree: Scrub 2 raw medium-sized red beets, place in a small saucepan covered by an inch of water, and boil until tender when pierced with a knife, 20-30 minutes or so. Drain, let cool to room temperature, peel, then cut into large pieces and puree in a food processor until smooth. You’ll probably have enough puree for a few cakes. Store in the refrigerator for up to 1 week, or freeze for up to several months. Substitutions: For the flours, you can probably use brown teff flour or millet flour in place of the ivory teff flour. 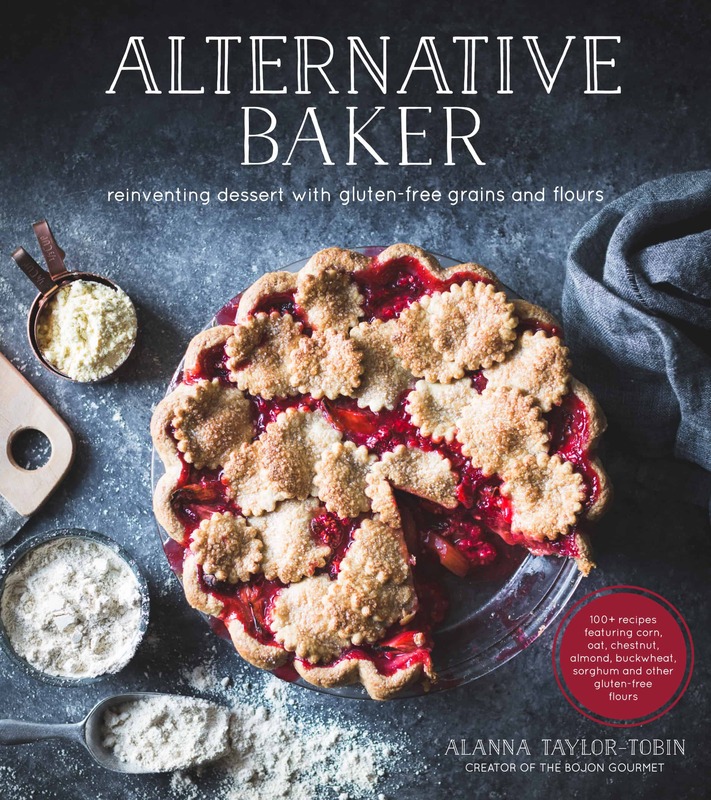 Or you can try subbing your favorite gluten-free all-purpose flour blend in place of all the flours (preferably by weight). If you only have natural cocoa powder, it will work here, but the cake will have a more acidic, beet-forward flavor and the cake may be more dense. If you can’t find cultured buttermilk, try using kefir in its place, or plain runny yogurt thinned with a bit of milk or water to the consistency of heavy cream. Pan sizes: Double the recipe to make a 9-inch round layer cake or 9-inch square sheet cake, increasing the baking time as needed. Try tripling the recipe for a 9x12-inch sheet cake, increasing the baking time as needed (a double batch of frosting should be sufficient here). For cupcakes, fill 6-8 lined cupcake cups two-thirds of the way with batter and decrease the baking time as needed. Do-ahead: The cake can be made 1 or 2 days ahead and stored covered at room temperature. 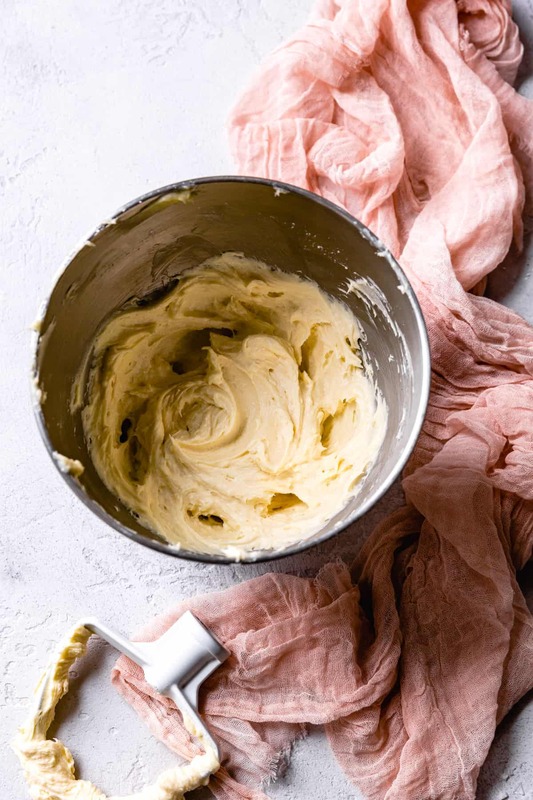 The cream cheese frosting can be made up to several days ahead, colored or not, and stored covered in the refrigerator. Bring to room temperature and stir well before using. Intriguing to say the least! I like the fact that the frosting does not end with a beet taste, it looks gorgeous. So do you need to worry at all about how much water still stays in the cooked beets? Or just puree them and not worry at all? How does on make or where to procure Beet Powder? Hm good question! I got mine at my amazing co-op in the section of bulk herbs and spices. 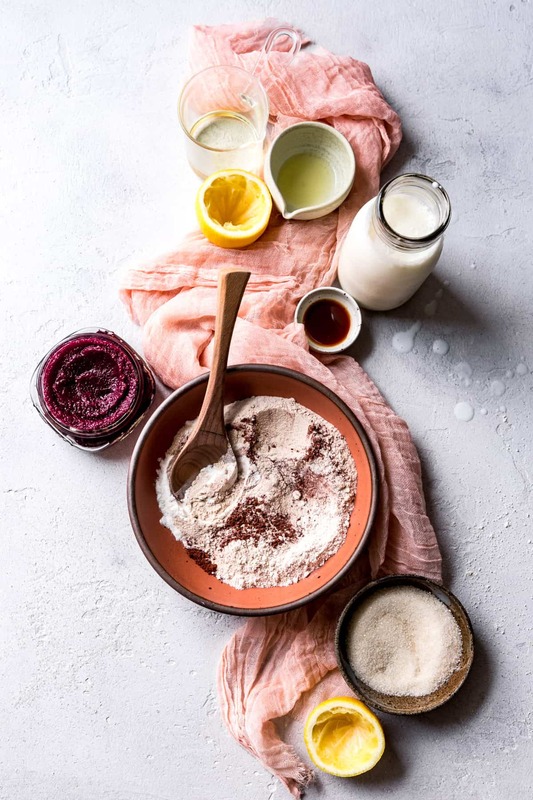 It looks like you can buy some here, although it’s a bit of a large quantity: https://www.lovebeets.com/product/beet-powder/ It’s really good with steamed milk, honey, and ginger too! Alanna! this is all so beautiful! I’m really, really loving all these pretty pink shades. Red velvet is my sister’s favourite, already bookmarking this for her birthday (which isn’t till July haha)! Looks like you’ve outdone yourself. Look at that extraordinary multi-colored effect on the frosting. Simply wow. Can’t wait to try, one of these days. Yes I like red velvet cake and yes i love cream cheese frosting. Aw thanks Monisha! My lovely assistant Bebe made it look so pretty. Please let me know if you whip one up! Thank you! But did you mean to give it 4 stars? 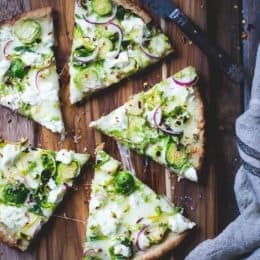 Oh my gosh this is pretty, and sounds so delicious! !